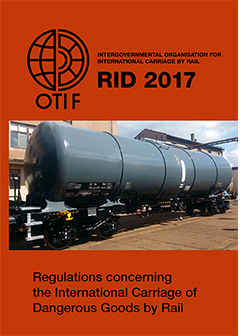 Regulations Concerning the International Carriage of Dangerous Goods by Rail (RID) is the part of the Intergovernmental Convention concerning the International Carriage by Rail (OTIF) and Appendix C which is the Regulation concerning the International Carriage of Dangerous Goods by Rail (RID). OTIF concerns the movement of passengers and goods by rail across national borders. OTIF concerns the movement of passengers and goods by rail across national borders. It controls the conditions under which that transit is undertaken and establishes a uniform system of law in order to facilitate the continuing development of international rail traffic. This edition is effect from 1 January 2017.